Today I have two more previews of our upcoming release to show you. If you are stopping in this week for the first time, you may want to check out this post that shows yesterday's previews first. All sets will be available for purchase this Thursday, August 8th. We will be having a blog hop and fun giveaway on the 8th as well so you won't want to miss it!! 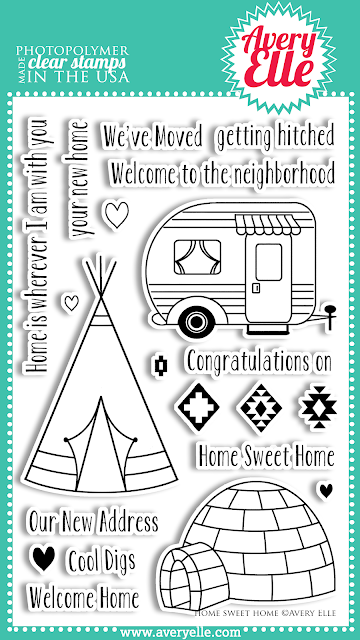 We love our 4" x 6" Home Sweet Home clear photopolymer stamp set. The sentiments and cute camper, teepee and igloo images in this set are fun, fresh and perfect for so many occasions. 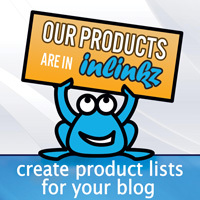 We tested every major manufacturer to find what we consider to be the best clear stamps in the industry. We find our photopolymer stamps are clearer, require little conditioning, stamp smoother and crisper using various ink types. Even better, our high quality cute stamps are made in the USA. 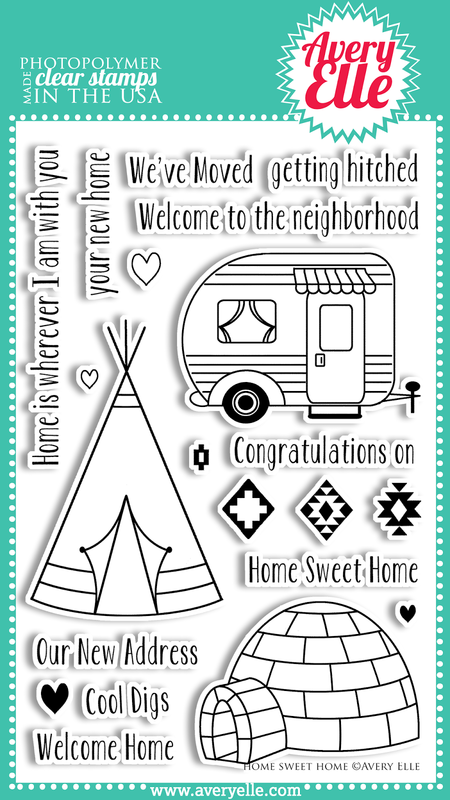 Home Sweet Home Sentiment Measures: 1 1/2" x 1/4"; Teepee Image Measures: 1 3/4" x 2 3/4"; Camper Image Measures: 2 1/4" x 1 3/5"; Igloo Image Measures: 2" x 1 1/2"
We love our 4" x 6" Happy Camper clear photopolymer stamp set. Use these cute outdoor and animal images to create your own custom outdoor scene. 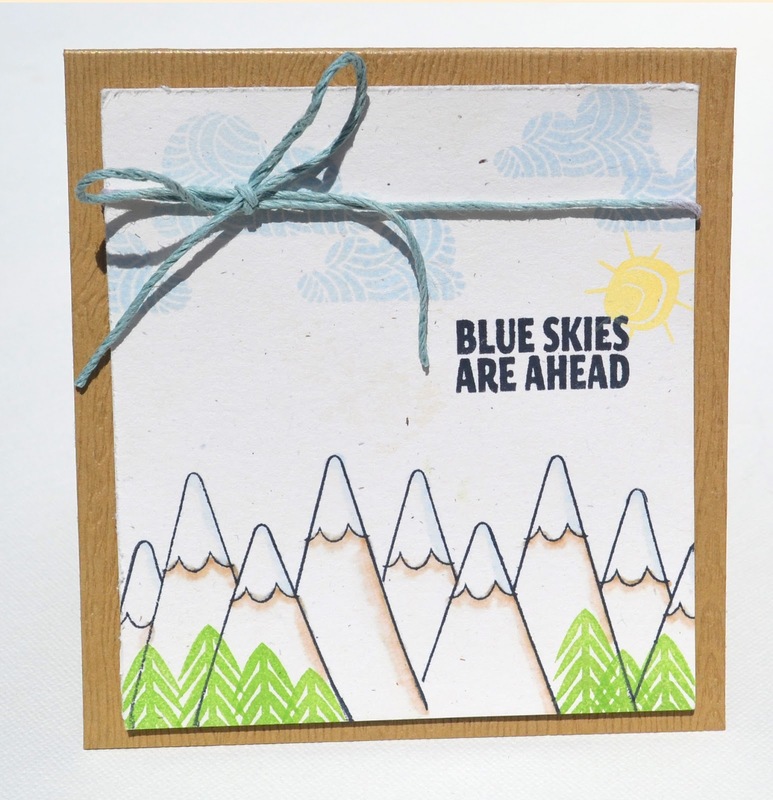 The sentiments included in this set are perfect for both friends and family. 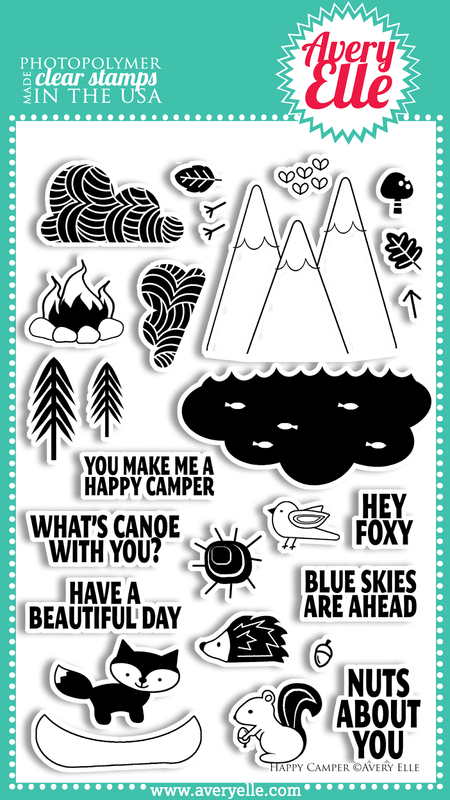 Nuts About You Sentiment Measures: 4/5" x 9/10"; Large Cloud Image Measures: 1 3/10" x 3/4"; Lake Image Measures: 2 2/5" x 1 1/10"
I created this sweet outdoor scene using our new Happy Camper stamp set. I did a bit of masking to create the border of mountains along the bottom and shaded them with markers. I stamped the rest of the images to complete the card. It was quick and easy to put together. Thanks for stopping by to take a peek. 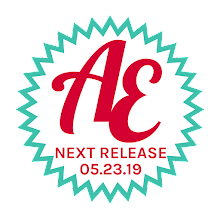 We hope to see you tomorrow for our final two previews of this release. Have a great day! Oh my goodness how adorable! Love both new sets! Super cute sets!!! love them!! Absolutely adorable! Love that they're 'seasonal'!! Awesome sets! These are my favourites so far, especially that last one with the designer clouds and squirrel. Eeek! Super cute sets! Love the little trailer! Really love both these new sets. LOVE both of these new sets!! Oooh these are so fun! I especially love the lake with the fish. You've outdone yourself with these sets!! The teepee? The igloo? Those patterned clouds??? Be still my heart! CAN you say CUTE? These are adorable. I need these. These stamps are so, so cute! OK - officially in LOVE!!! !